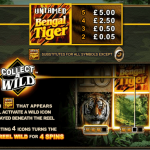 Untamed Bengal Tiger is the third game which is a part of Microgaming`s “Untamed” series. 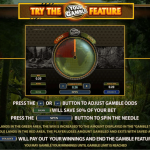 Delve deep into the exotic world and meet the tiger that can bring some huge wins to your bankroll. In the background of the reels you can see a hint of a green jungle and the calming sound effects will transport you to Southern Asia where the Bengal Tiger could be found. This is a 243 ways to win game so you do not have to worry about pay lines here, all you need is matching symbols on consecutive reels. Special symbols include a wild, which is the Bengal Tiger, and a scatter which is the tiger`s eye. The wild symbol substitutes for all the other symbols except for the scatter. During the game, every time a wild appears on the reels it activates a wild icon beneath each reel. Once you collect 4 wilds, the entire reel turns wild for 4 spins. The ideal situation here would be to fill up more than one box at the same time of course. Landing 3 or more scatter symbols will award you with 20 free spins. During the free spins every time a wild appears it will move down one place with every spin until it reaches the bottom. But, that is not all! Lucky nudge feature will help you trigger the free spins if you are missing a third scatter, in case it is peeking below or above the reels. 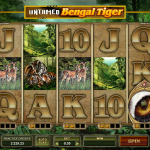 Untamed Bengal Tiger from Microgaming portrays nature in its full glory. This is a beast of a slot that you should definitely try. Many different features, beautiful design and soothing sound effects will keep you entertained for a long time. Remember Lara Croft? Well here is your chance to join her in Tomb Raider 2 a 5 reel slot by MicroGaming.